I broke into the 30's!! Maggie's due date is getting so close! Sleep: This has been good and bad. This past weekend we stayed at my mom's and it was probably the worst two nights of sleep I've had in awhile. I think at this point if I'm not in my own bed I'm not going to be able to get any rest. The last two nights have been almost heaven. I started drinking peppermint tea right before bed, and I've slept through the night besides one bathroom break! Not sure if it's a coincidence but I'm going to keep drinking it and let you know. Holla! Movement: She's been pretty active this week. The best is when I go to see movies, she goes crazy! I guess because of all the loud noises. This past weekend we went to see Les Miserables with some friends and she kicked & moved around through the entire (almost 3 hour) movie. Ryan & I were almost too distracted by Maggie to actually pay attention to the movie. But the it was so good that I still came out crying. It's a must see! Unglamorous body changes: The heartburn has been better since I started drinking the peppermint tea, but it's only been two days. Ha! I tweaked my lower back this weekend and it's been pretty sore but getting better. I think I just over did it with our busy weekend. Food cravings: Still lots of sweets. I realized that I don't really crave candy but more baked goods kind of sweets. I'm also really loving strawberry flavored anything. What I miss: Not too much but probably having my full energy back. Best moment this week: So many!! Feeling Maggie go nuts at the Les Miserables movie, the incredible baby shower thrown by my in-laws and our maternity shoot this past Sunday (even though it was freezing!). But probably the best moment was my best friend, Kara, having her baby TODAY at 1:30 am this morning!! I can NOT wait to meet little Greta Mae. So excited for them. Looking forward to: My SIL, Emily, & Sean visiting this weekend, and I have a small friends shower on Sunday here in Bartlesville. I'm also looking forward to slowing down. I think I've definitely been over doing it, and I've started to cancel things because I am just completely worn out. Ryan & I started to realize that we have a limited amount of weekends left before our lives change forever. It's so crazy to think we may only have a few free weekends before Maggie comes. I'll be considered full term in just 7 weeks. 7 WEEKS! Even though I have a feeling I'll be late. Still so much to get done before she gets here! I will never forget visiting the Bose store at the Ozarks and going in for their demonstration while pregnant with Chloe. As soon as the sound came on she jumped so hard in my belly! It was funny/startling all at the same time. I think it's smart for you to slow down and take this time for you and Ryan. It's hard to say no to things, but you gotta make sure you are feeling good too. Hmmm, peppermint tea!? I must try that! You look so great! Can't wait to see your maternity pics! Yay! 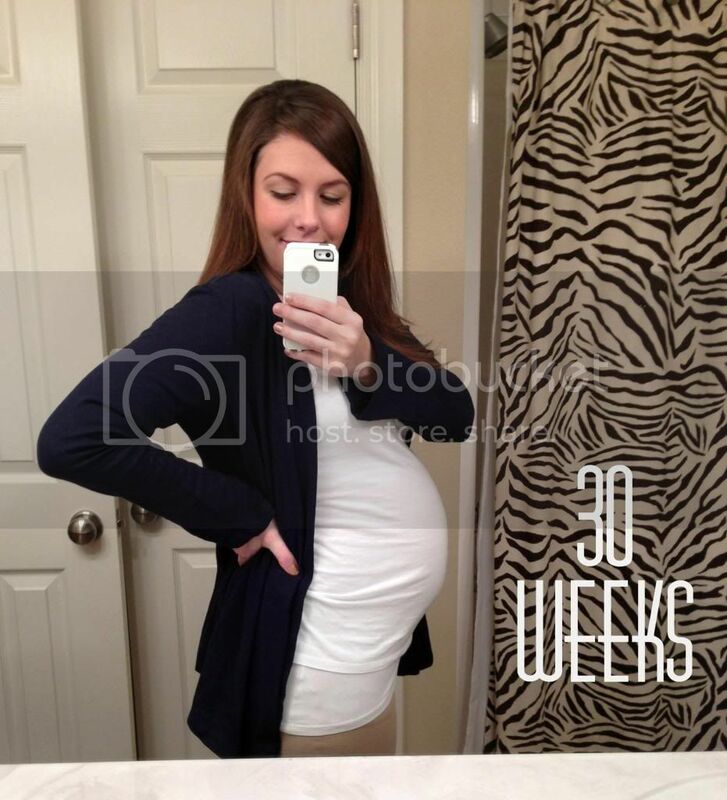 30 weeks is a big milestone! I remember my hair dresser told me after 30 the rest of the time flies by. Eeek! She was right. :) Enjoy these last few weeks. You look beautiful! Yay for entering the 30's.... you're so close! Im just now reading that baby girls name is Maggie! I LOVE that name!! !